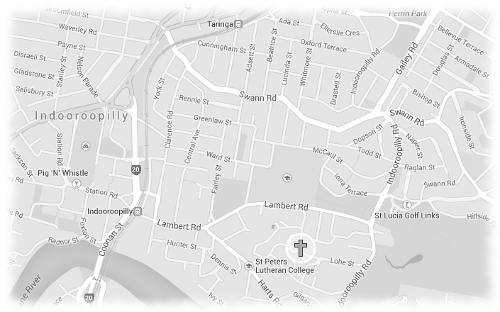 St Peters is located in Indooroopilly, a western suburb of Brisbane, the capital city of Queensland. Queensland is the most northerly state on Australia’s Pacific (eastern coast). St Peters congregation is a member of the Lutheran Church of Australia, and forms part of the Queensland District of the Lutheran Church of Australia. St Peters, Indooroopilly is the mother congregation of the St Peters Parish. Its sister congregation is St Peters, Springfield which is just beginning its work. The Indooroopilly congregation was founded in the 1970s. It was formerly known as Resurrection Lutheran Church. The Indooroopilly congregation worships in the St Peters Lutheran College Chapel. Both the Indooroopilly and the Springfield congregations work closely with their respective Lutheran schools. The school chaplains regularly assist with congregational worship services. Our congregation is small, with an average attendance under 100. It has some families with young children, a number of single people and also empty nesters and grandparents. The congregation currently uses at least four different worship services each month. These are formal or liturgical services each offering Holy Communion. Once per school term a class of school students takes part in the worship. On these days the service is less formal. The congregation provides less formal worship when musicians (or technicians) are available. The choir, organists and pianists are a feature of our worship especially during the festival seasons of the Church Year. Children are welcome in our worship. Some children are already taking part in worship by reading the Bible or leading the prayers. We endeavour to have our worship include a story for children at each Sunday during school terms. There may also be activities for children during worship.